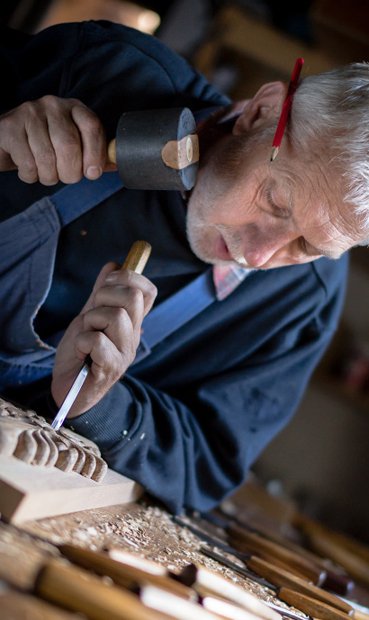 Slovakia can be proud tradition of carving several centuries. The carvings biggest boom during the late Gothic of the file where the particular through merit Master Pavol from Levoca created works that are even written in register of UNESCO. Later on carving developed mainly through pastoral art like - mugs , cheese molds or carved musical flutes or fujaras. Carving was however a normal part of the work of men during the winter time when a long passed their time carving necessary things to homes , cribs , toys and statues. Such an amateur carver belonged to the grandfather of Vladimir Simik sr. from the village of Dolna Marikova in Javorniky mountains. Love of wood but master Vladimir Simik inherited from his father - carpenter. After school with renowned woodcarvers masters from Rajec area Vladimir Simik sr. started open his work shop and started with carvings. It's been more than 40 years working as brand ,, Rezbar Simik ,, and thanks to family tradition will continue to work in long future. Thanks to decades of hard work with wood in the Simik family developed a great sense of detail and quality. The base is mainly traditional hand made which is less and less artists do. The accuracy for quality work with wood in the family was learned gradually and it took many years. In addition to carving began and joinery, carpentry and restoration of many historic pieces. Only years of experience and studying from the best masters are carving Simik family can work a few centuries back and work with the same techniques as it was many centuries ago. Due to the fact that they can comply with the same techniques of the old masters preserving their work for future generations . Martin Simik and Vladimir Simik jr. served also as artistic carvers several years abroad while there brought new techniques and especially a sense of quality work . Thanks to family tradition developed over several years carving recognizable handwriting which is the traditional quality guarantee. Will tell you more a finished work of art that can be found in more than in 50 churches in Slovakia as well as in private collections around the world. Products of Simik families are not pieces that emerge from the production line machine. Whenever it comes to honest toil but ultimately of each piece feel the heat. This is what we do and we do it well.